Wednesday August 21st 1895 I got up early and worked fast. 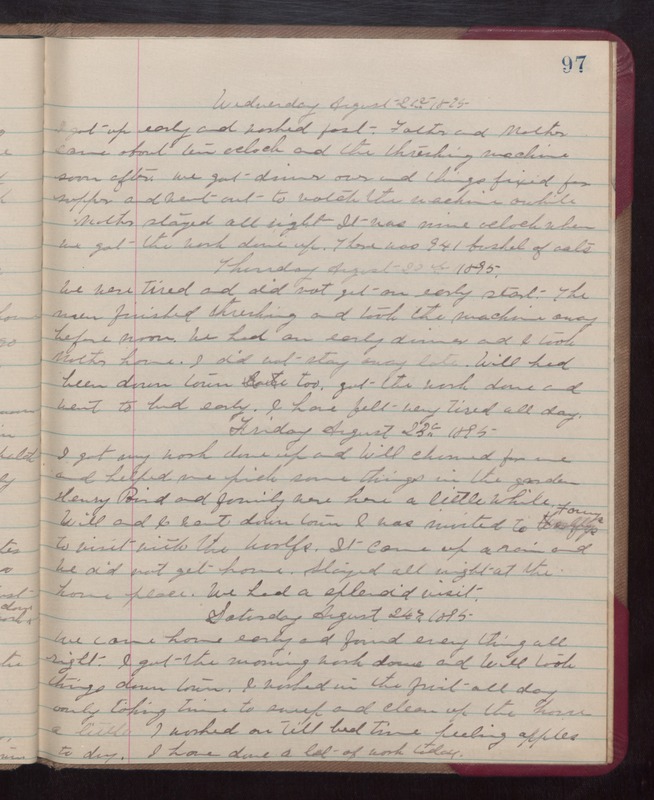 Father and Mother came about ten oclock and the threshing machine soon after we got dinner over and things fixed for supper and went out to watch the machine awhile. Mother stayed all night. It was nine oclock when we got the work done up. There was 941 bushels of oats. Thursday August 22th 1895 We were tired and did not get an early start. The men finished threshing and took the machine away before noon. We had an early dinner and I took Mother home. I did not stay away late. Will had been down town too. got the work done and went to bed early. I have felt very tired all day. Friday August 23rd 1895 I got my work done up and Will churned for me and helped me pick some things in the garden. Henry Baird and family were here a little while. [note: the yearbooks for the University of Iowa indicate that Henry Baird graduated in 1892] Will and I went down town. I was invited to Fannys to visit with the Woolfs. It came up a rain and we did not get home. Stayed all night at the home place. We had a splendid visit. Saturday August 24th 1895 We came home early and found every thing all right. I got the morning work done and Will took things down town. I worked in the fruit all day only taking time to sweep and clean up the house a little. I worked on till bed time peeling apples to dry. I have done a lot of work today.